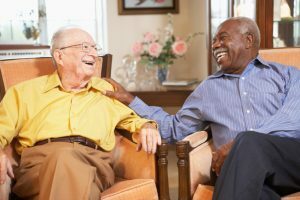 Mainstream retirement communities often deny LGBT elder couples the right to live in them so they often continue to live on their own, even if they need access to the services offered by those communities. These elders may fear discrimination and be ostracized by housing staff and often stay in the closet to obtain housing. Because large numbers of gay elders choose to live alone, they have fewer opportunities for social interaction than their heterosexual peers. One LGBT program in California created social connections through arranging dinner parties, shopping trips, and grocery shopping. Finding activities that help elders grow and nurture their emotional, intellectual, physical, and/or spiritual quality of life can help to nurture an older person’s whole life and bring back joy. For example, look at this youtube on an older woman who reconnected with art, which is her talent and spirituality and younger people plus her family, through a quality of life assessment. 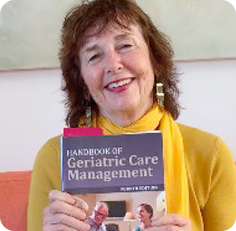 The Handbook of Geriatric Care Management 4th edition has a seminal chapter written by geriatric care manager Nina Herndon with a quality of life assessment to help you pinpoint the quality of life needs of all clients. Nina also has developed the first activity kit for the quality of life, Joyful Moments . Why Does the Nearly Normal Family Melt Down Over the Holidays ? Many aging families are healthy or a nearly normal family But discovering they must care for a parent can force them into a tailspin. When the parent figure in the family begins to suffer the losses of aging, a filial crisis occurs. Finding activities that help elders grow and nurture their emotional, intellectual, physical, and/or spiritual quality of life can help to nurture an older person’s whole life and bring back joy. For example, look at this you tube on an older woman who reconnected with art, which is her talent and spirituality and younger people plus her family, through a quality of life assessment. Why Does the Concierge Nearly Normal Family Melt Down Over the Holidays ? Many concierge aging families are healthy or a nearly normal family. But discovering they must care for a parent can force them into tailspin. When the parent figure in the family begins to suffer the losses of aging, a filial crisis occurs. What’s that-? 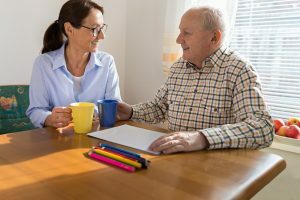 That is accepting your parent in the here and now .When a Mom or Dad is no longer the north stars they were to the family, midlife adult children need to learn to learn to balance parental love and duty with independence. These midlife kids must create a two-way relationship instead of the parent sending, love, money and nurture only one way. This can throw adult children in a nearly normal family into a parental panic.